His family members have maintained a low-profile throughout yet a fondly intimate one, as evident from the pictures that have been occasionally shared. After what has been confirmed by his son Sarfaraz to be a prolonged illness, actor-writer Kader Khan passed away today morning. The late scriptwriter’s journey was one that can be summed up as ‘from rags to riches’ as his family moved from Afghanistan to India in search of a better living and he struck gold the moment ace actor Dilip Kumar saw his theatre works and immediately signed him for two of his movies. Rest, as they say, is history. Kader Khan married Azra Khan in mid-1970s and bore three sons with her. His family members have maintained a low-profile throughout yet a fondly intimate one, as evident from the pictures that have been occasionally shared. While his eldest son, Quddus Khan works as a security officer at an airport in Canada, his second son, Sarfaraz Khan, is an actor-producer who has appeared in films like Tere Naam and Wanted. Sarfaraz is also the co-founder of an international company, Kal Ke Kalakar and some of his favourite movies of his father are Aaj Ka Daur (1985), Coolie No.1 (1995) and Dulhe Raja (1998) among others. Shahnawaz Khan is the late actor’s youngest son who studied in Canada and has assisted in films like Mileinge Mileinge, Vaada and Humko Tum Se Pyaar Hai while having directed In Your Arms. His favourite movie of his father in Angaar (1992). 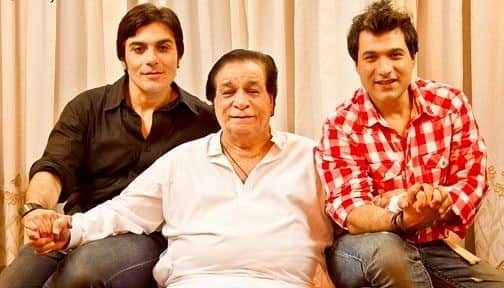 Seen in the pics is Kader Khan with his two younger sons Sarfaraz Khan and Shahnawaz Khan. The iconic actor was apparently suffering from Progressive Supranuclear Palsy, a degenerative disease that causes loss of balance, difficulty in walking and dementia.